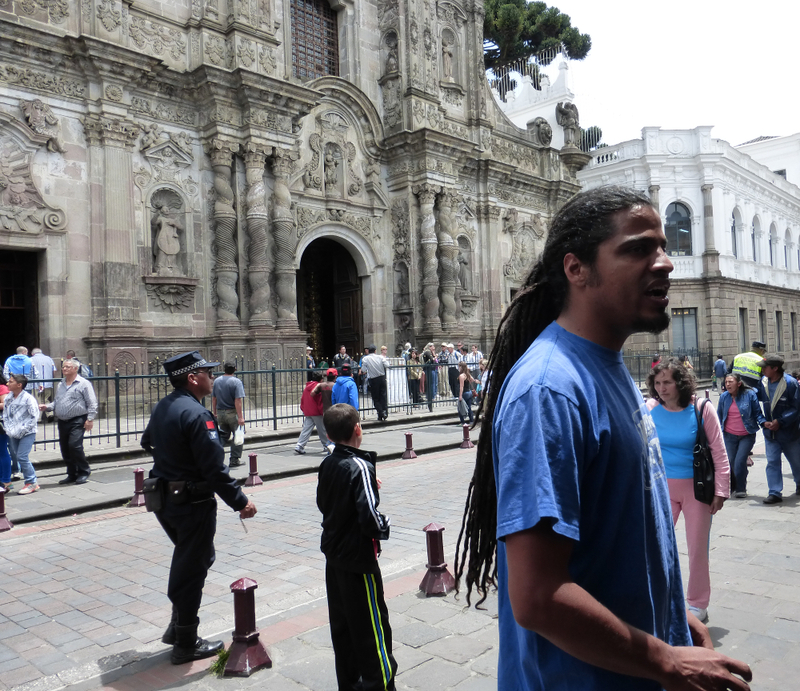 We took the Free Walking Tour about 2 weeks into our visit to Quito, Ecuador. In retrospect we wish that it would have been our first stop. Here’s why . . . This is as comprehensive a city tour as I have taken and paid handsomely. For those that haven’t done a “free” walking tour before, the guides work for tips. So they tend to put more effort into entertaining you. This was is provided by the Community Hostel and guided by one of the experienced staff. In our case, that was Ovi. Ovi breaking it down . . . The walking tour lasts about 3 hours and is an easy walk through Old Town with plenty of stops. Ovi started us off at the Central Market where he described the typical dishes of Ecuador. He also pointed out the fruits from the region and the the role exports play in the Ecuadoran economy. Surprise fun fact: the biggest export is not fruit but is actually oil. 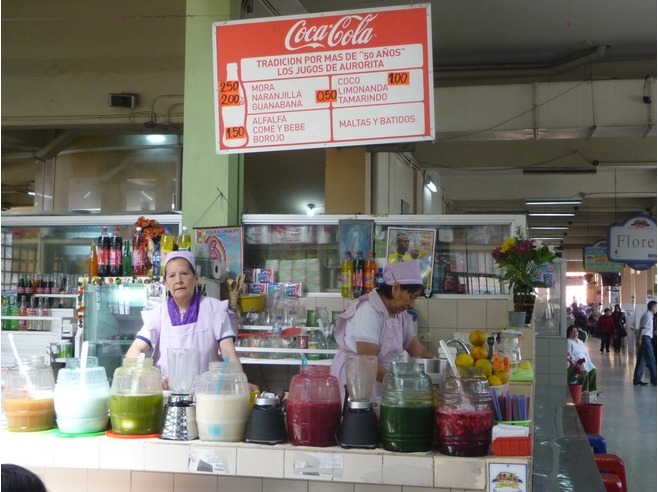 We then sampled some fresh juice from a vendor inside the market which can be blended to taste. Our pick – mora (blackberry) with coconut milk – delish. We moved on to the historic city center where we were given a brief history of Ecuador, learning how it gained its independence from Spain. Ovi pointed out specific buildings and explained their significance. We also learned about Ecuador’s decision to move to using the US dollar as its currency and the implications for life in Ecuador. According to Ovi, those Ecuadorians who left during the devaluation of the currency prospered in countries such as Spain and Italy. They sent money to their relatives who remained in the country. Now returning to Ecuador, many of these people were able to construct huge homes. This explains why we saw mansions in the midst of impoverished areas in the countryside. From there we visited a candy shop where we were given an explanation of each kind and invited to purchase what we wanted to sample. Not finished yet. We were given a tour of the interior of the San Francisco Church and were told about the artwork inside. This was followed by a trip to a chocolate shop where Ovi gave a presentation about how chocolate is made. We were shown the area where the black market had been ousted from several years ago. 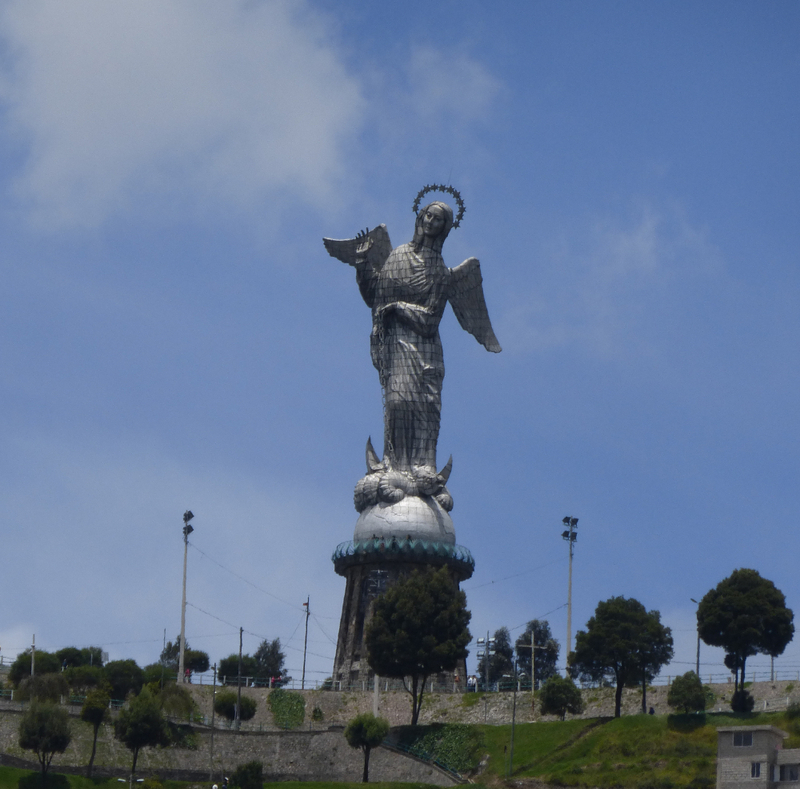 We were told that the climb to see the La Virgen de Quito statue at the top of the hill above was not recommended. The thieves that were moved out of the black market apparently wait for tourists to make the climb and are ripe for mugging. Tip – take a taxi to the top if you want to see the statue. We had been planning to hike the stairs in 2 days. Scratch. Can you believe this is a free walking tour? 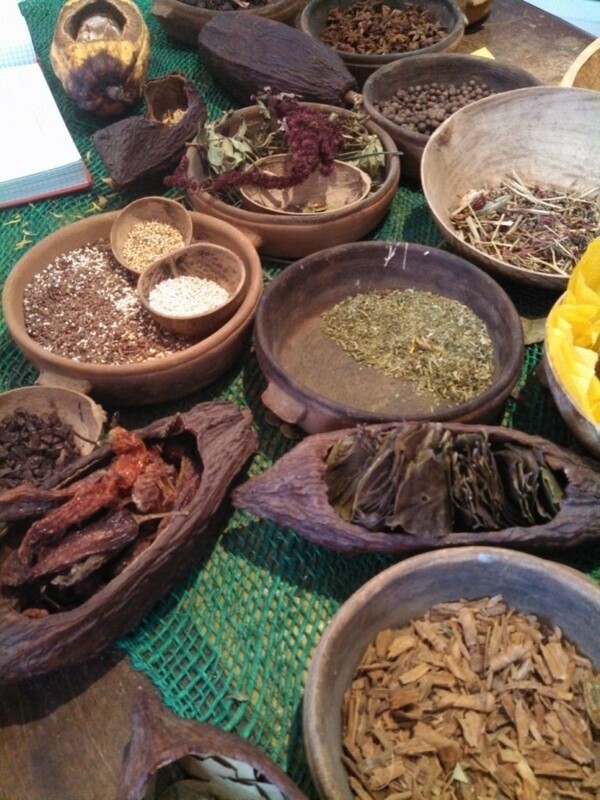 He ended the tour with a trip to a few artisan shops and an invitation to Almuerzo (lunch). 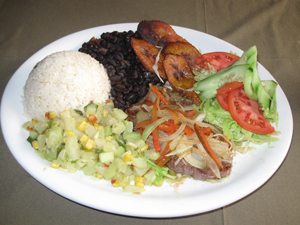 There are several restaurants dotted throughout the City who serve a typical Ecuadoran lunch. This is typically of a glass of fresh juice, salad or soup, rice, fried plantains, beans and most commonly fish, beef or chicken. Always accompanied with a sauce called Aji (mildly spicy creamy condiment with fresh onions). As a bonus we got to meet some interesting people and were given additional recommendations about Quito and other places that we were planning to visit. The tour in sum was fantastic and well worth the price tag of “free”. But don’t worry, we did give Ovi a tip to show our appreciation. If you go, we recommend you do the same. Great recap of this walking tour. I completely agree, free walking tours are often just as good, if not better than the ones I’ve paid for. We always try to book some kind of tour early in our visit to get the lay of the land for further exploration. If you can’t find a free walking tour, check iTunes for a podcast tour. We’ve done a few of these and they have been a good substitute. Congrats on the Liebster Award! The podcast for walking tours is a fantastic idea too. We’ve done that and it really does make a huge difference.Happy Travels! Love the photo of the candy shop! What an amazing experience! Great post! I discovered the joys of walking tours a few years ago and try to take them whenever I’m in an urban area. Great tips from yours and yes, ‘free’ tours aren’t really. It’s only fair to tip well if you’re happy with the experience. Sounds like you got more than your money’s worth. I love free walking tours. It’s one of the first things I look for in a new city now because it really does give you a good lay of the land, and like you said the guides are always so happy and eager, which makes me want to tip them more than I probably would have paid for a tour in the first place. 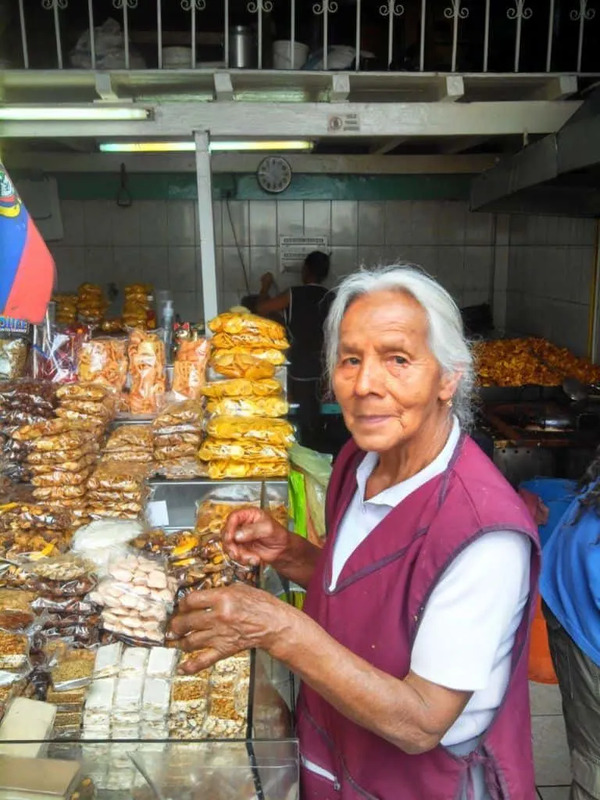 The typical Ecuadoran lunch would be great to try. I love trying traditional food in new countries, although I’m not extremely adventurous when it comes to food. I love free walking tours. They showcase the best parts of cities. Plus it’s a great way to get a feel of a city from a local. A lot of people tend to stay away from tours, but I think they can be really helpful to first get acquainted with a new city. It looks like you guys learned a lot! I love when you get the “extras” such as the tip on not climbing to the statue so as to avoid being a tired target of the petty criminals. 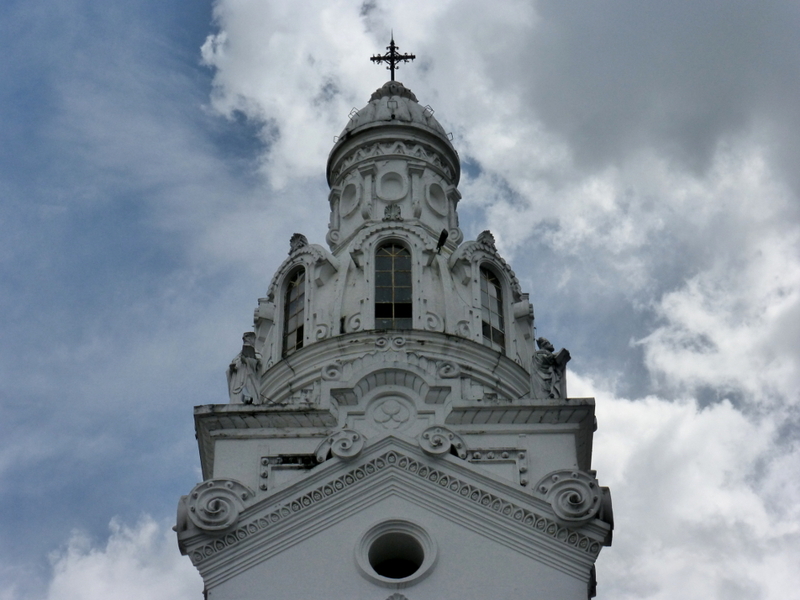 My jaw dropped when I saw the church – I can only imagine how beautiful it was in person! I love walking tours, this one sounds like something I’d really enjoy. I didn’t know that Ecuador exported oil at all… or that they use the dollar! Good travels y hasta pronto!!! Hi Ovi – Yes we loved the tour and happy that you found it. We saw on Facebook that you were recently married – congrats to you both. We will look you up if we make it back to Quito. 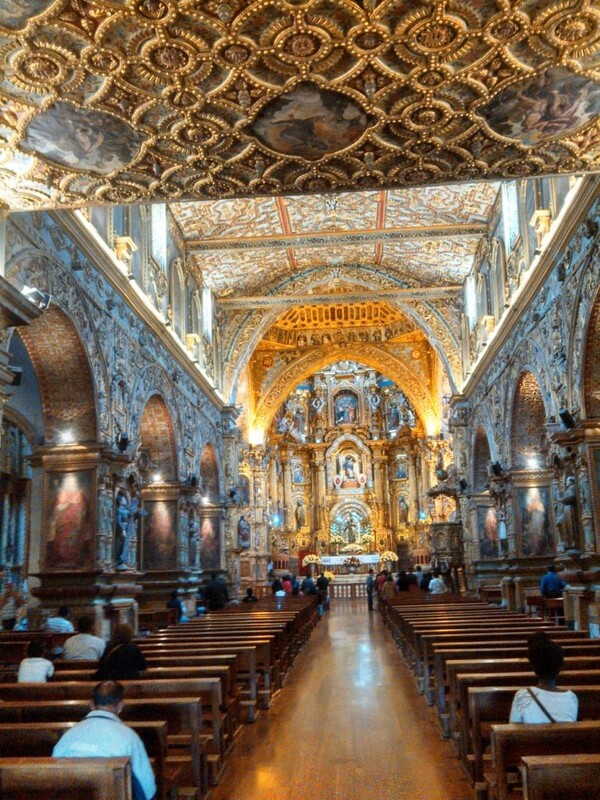 And no question, we highly recommend starting a visit to Quito with your tour. Sorry I never replied to this but i have been so busy!!!!! 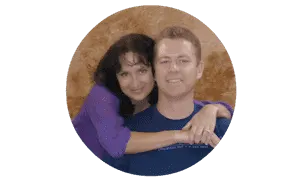 I got married, my wife got pregnant right away, I have a baby, and Im still involved with the tours and the Community Hostel and now the travel agency Community Adventures!!! tour is going great and now we have two other guides also running tours. I hope everything is going great on your end. are there any tours in the afternoon? You’d have to check with the Walking Tour group – they’ll be happy to give you the current schedule.